Welcome to week 6 of the CHIP IN Education Initiative! This week, chip in and expand efforts to educate consumers and small businesses about chip card payments using the chip education video. You can share anything here as-is, create your own handouts and resources pointing to GoChipCard.com, or do a combination of the two! Let’s focus our efforts on educating the marketplace using an educational chip video that shows how to use a chip card in stores and at ATMs. Use these recommendations to educate consumers and small business owners, and incorporate your own ideas, too! This week, let’s join together and focus our social media efforts around teaching consumers and small businesses how to use a chip card. Have you done a chip card transaction yet? Consumers get a lot of information from the media. Communicating accurate and consistent messages with the media is one of the easiest ways we as an industry can help educate the market on chip cards. What resources are available for consumers to learn how to use their chip card? There's a new educational video available that shows how to use chip cards in stores and at ATMs. Consumers can view it at http://www.emv-connection.com/press-room/chip-card-video/. 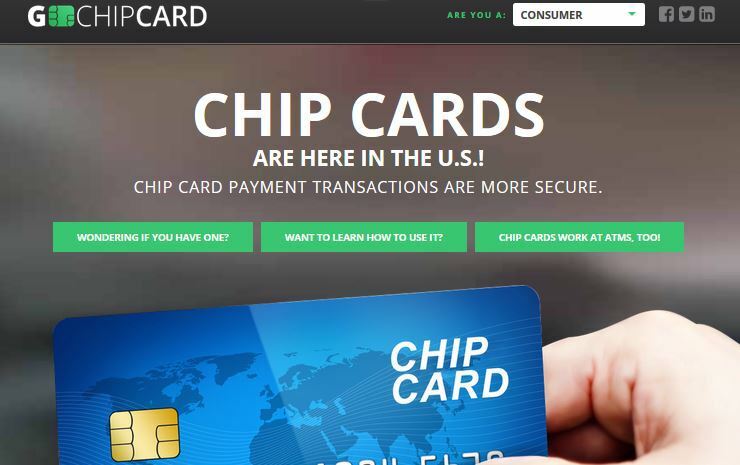 Also, they should visit www.GoChipCard.com, which answers common questions about chip, and teaches how to identify a chip card, why they're receiving them and why they're more secure than magnetic stripe cards. Will anything change for online purchases when using a chip card? Can chip cards be used outside of the U.S.? Yes. Chip cards are widely used in international markets and are accepted in more than 80 countries. Having a chip card will make it easier for consumers to make purchases when travelling internationally.